Happy 4th of July everyone! I hope you’re enjoying celebrating the birth of our fabulous country here in the US. My family will be celebrating this coming weekend with a pool party, so I spent the day working on several projects and enjoyed the fact that Marc was home mid-week. He helped me with lots of heavy lifting and shuffling furniture around. 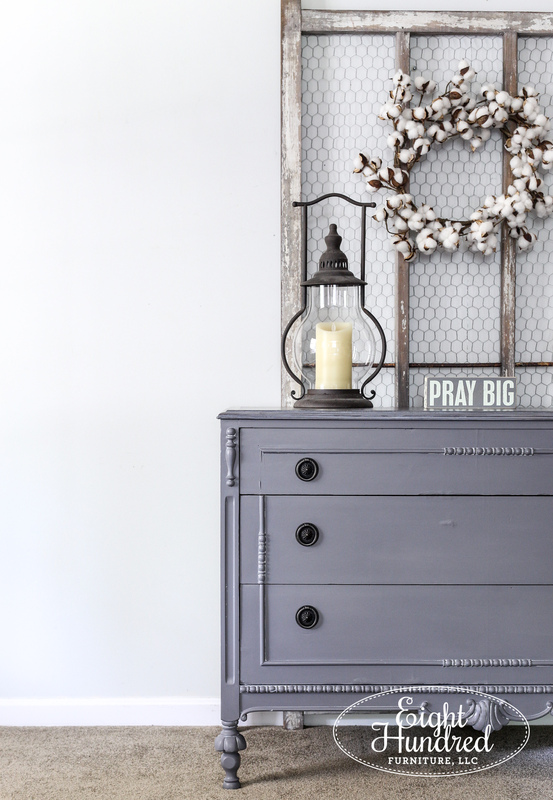 One of the projects that I finished today was this depression dresser. It had a lot of flaws but it was priced really well and I didn’t think its flaws disqualified it from being rescued and renewed. The veneer on the top was badly damaged. 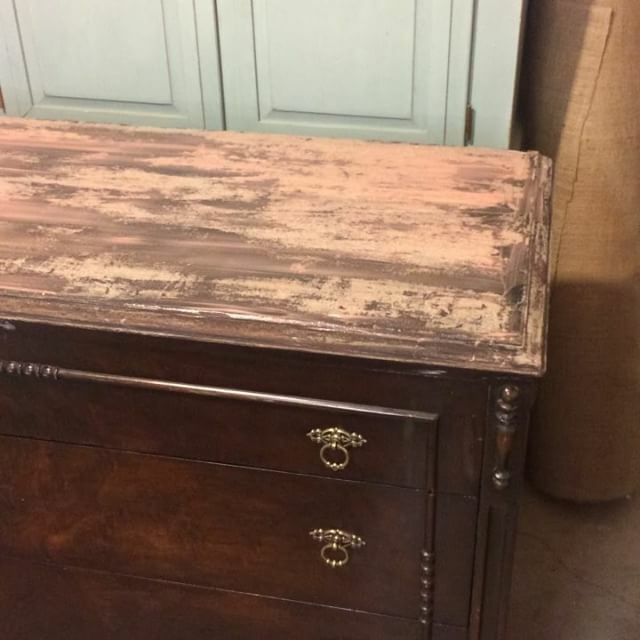 It was chipped and bubbled in several places and the original finish had been painted over with a heavy (and smelly) tinted lacquer. The pulls it came with were way too tiny for the size of the piece so it needed a complete overhaul. Needless to say, I had my work cut out for me but I embraced the flaws of the piece and dove in. I started with the damaged top and began stripping it to see if it could be salvaged. Friends, it didn’t get much better than what you see in the photo above. My only other option was to use a heat gun to remove the layer of veneer on top. I’ve demonstrated how to remove damaged veneer with a heat gun in this Facebook live video. It was slow going, so I removed it over the course of a week or so, attacking it in manageable patches. Once the veneer was removed, I spent time sanding down the wood that was underneath. I started with 80 grit and sanded off any little strips of veneer that stubbornly hung on and refused to scrape off with the heat gun. 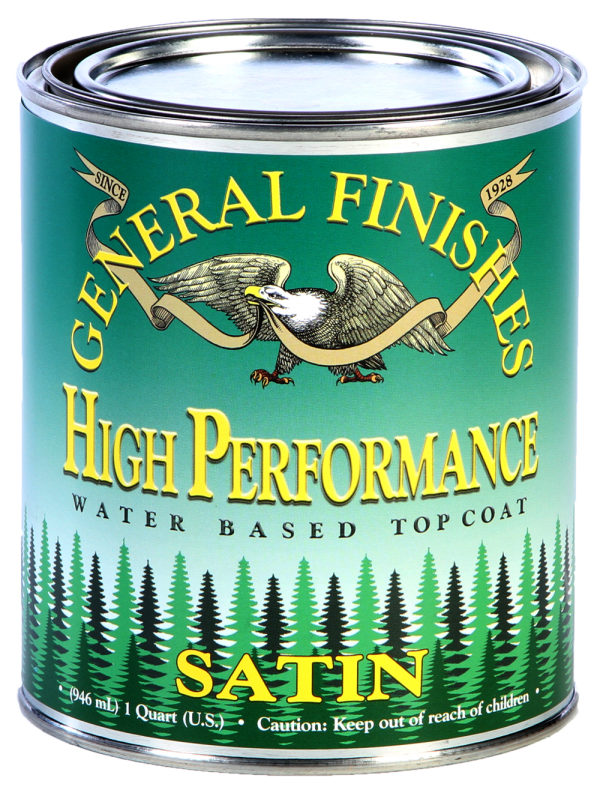 Then, I gradually did passes at 100 grit, 120 grit and finally finished at 150 grit. 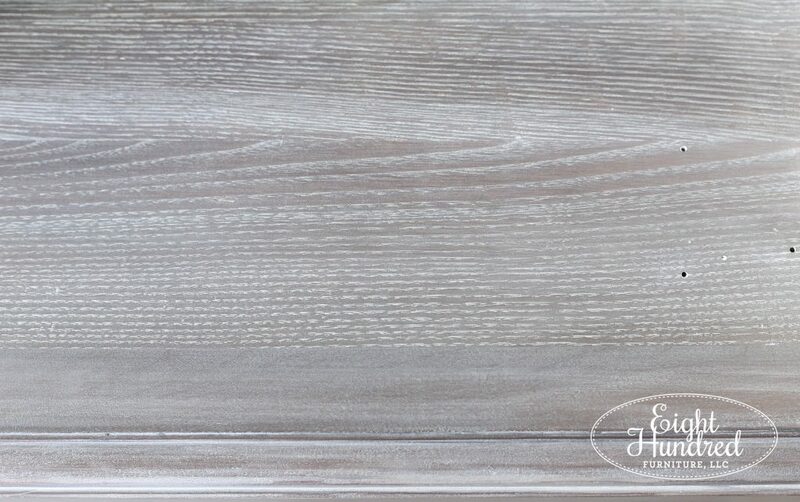 This progression of sanding is called a “sanding schedule” and by slowly increasing the fineness of the sandpaper with each pass, you prevent swirl marks and get a really smooth finish. Once the top was sanded, I was really pleased with the wood underneath. The middle was oak and it had lots of character, strong grain and even charming wormholes! There was a 1 inch border around the edge that was a different species of wood. I wasn’t quite sure what it was, but I was happy that I took the time to uncover it. I didn’t have a plan for the top yet, so I turned my attention to the bottom. 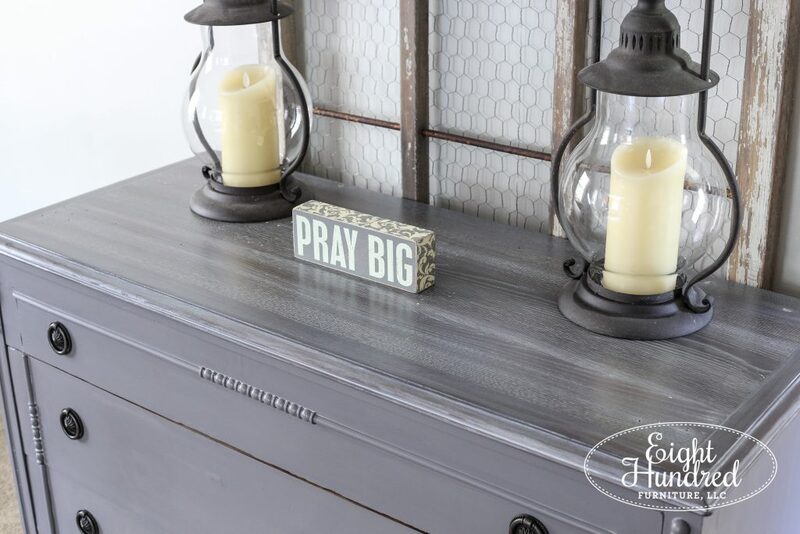 Because the finish on the dresser was so dark and heavily lacquered, I didn’t want to use a light colored paint because I thought it might bleed through. 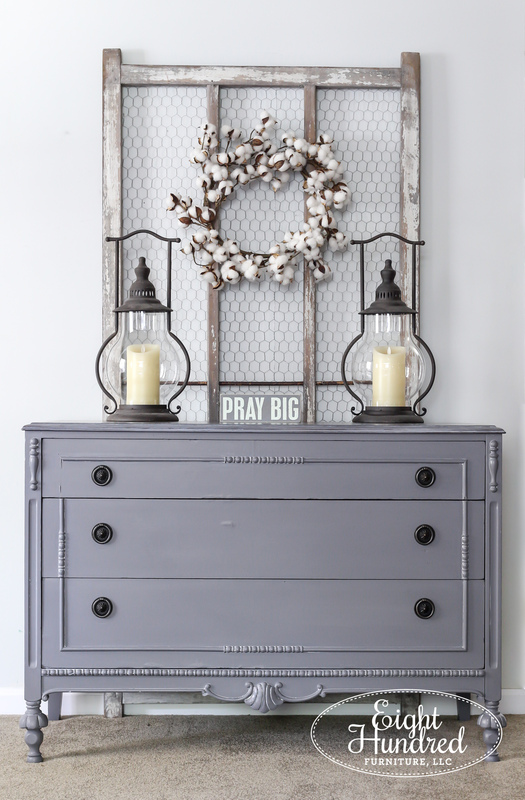 Instead, I settled on a mid-tone gray from the General Finishes Milk Paint collection called “Driftwood”. Since I decided the bottom was going to be gray, that gave me an idea for the top. 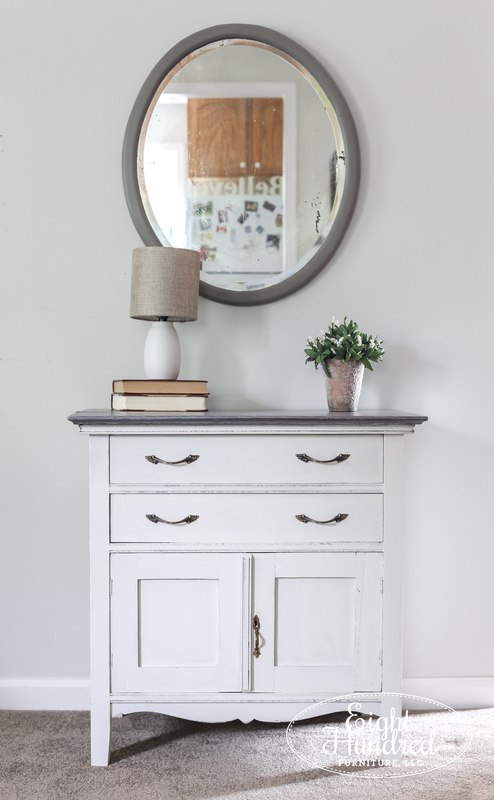 I wanted to recreate a driftwood stained look that I came up with on this white washstand. Here’s a look at that top. I thought it would look perfect for this dresser. 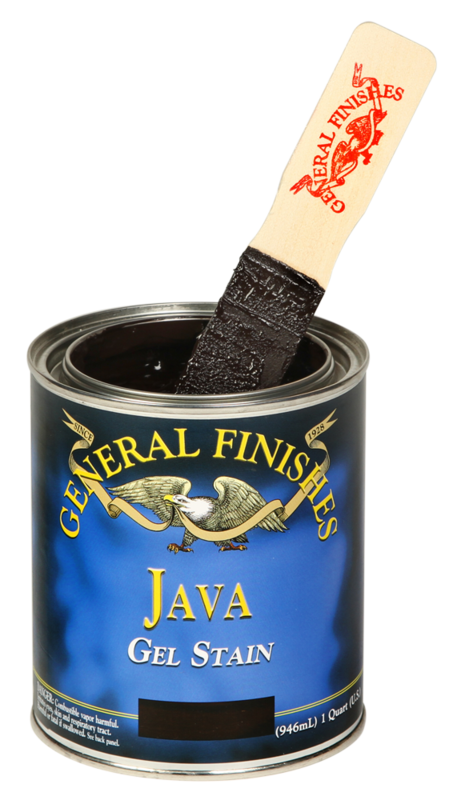 The process started by applying a layer of General Finishes Java Gel Stain. This serves as a dark base. I applied it, wiped away the excess and let it dry overnight. 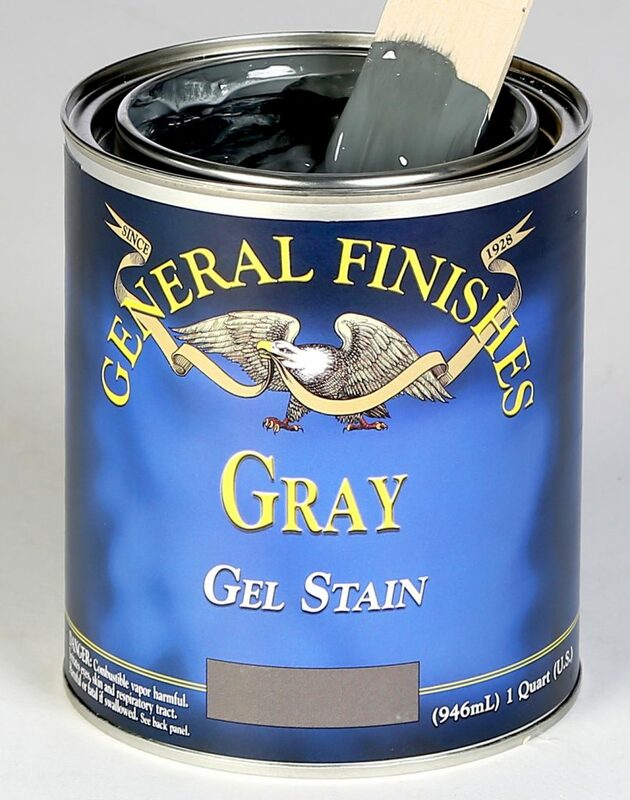 Next I applied a layer of General Finishes Gray Gel Stain. I wiped it back and let it dry overnight. Next, I applied a layer of High Performance Topcoat in Satin. I’ll tell you why in a second. Picture first! Once this layer dried (about 2-4 hours), I applied a layer of Winter White Glaze Effects and wiped back the excess. 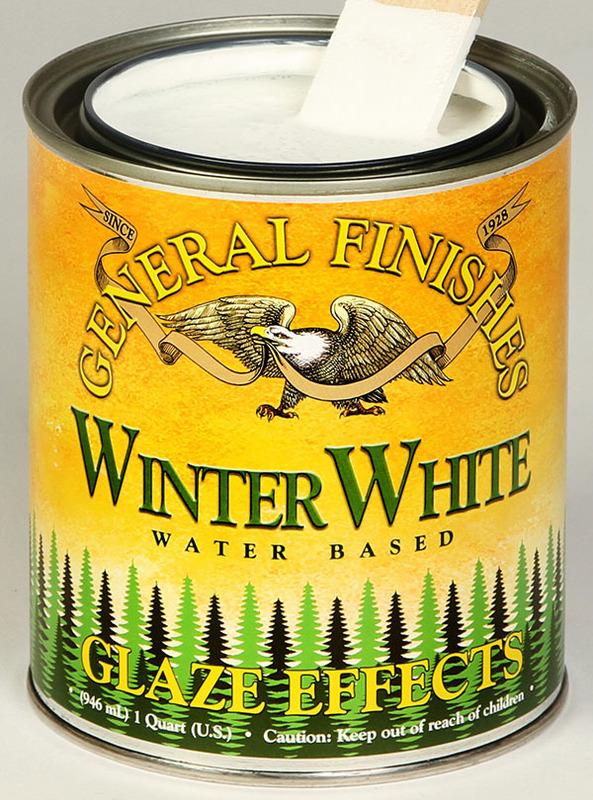 Glaze always goes on easier if you have a layer of High Performance Topcoat underneath it. It helps it “glide” on and wipe off easily. Once this layer dried (2-4 hours), I followed up with several more coats of High Performance Topcoat in Satin to seal the piece and protect the finish. Each coat was given 2-4 hours to dry in between. The process took me a few days to complete because of the dry time required for each layer. So that’s the top! Now for the bottom…. 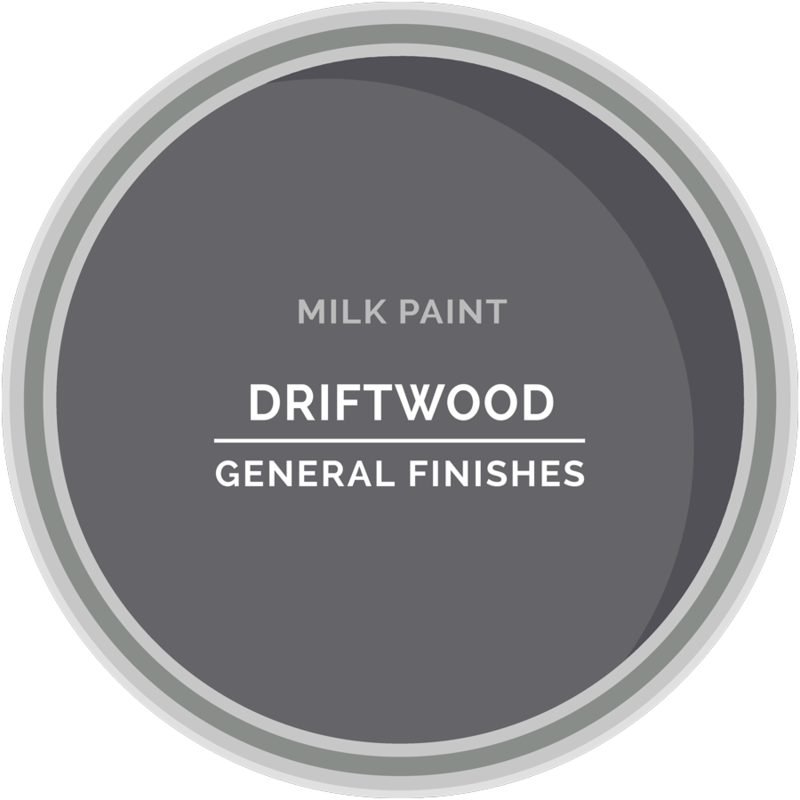 I applied two coats of General Finishes Milk Paint in “Driftwood” on the bottom of the dresser, gently sanding in between each coat to ensure a super smooth finish. 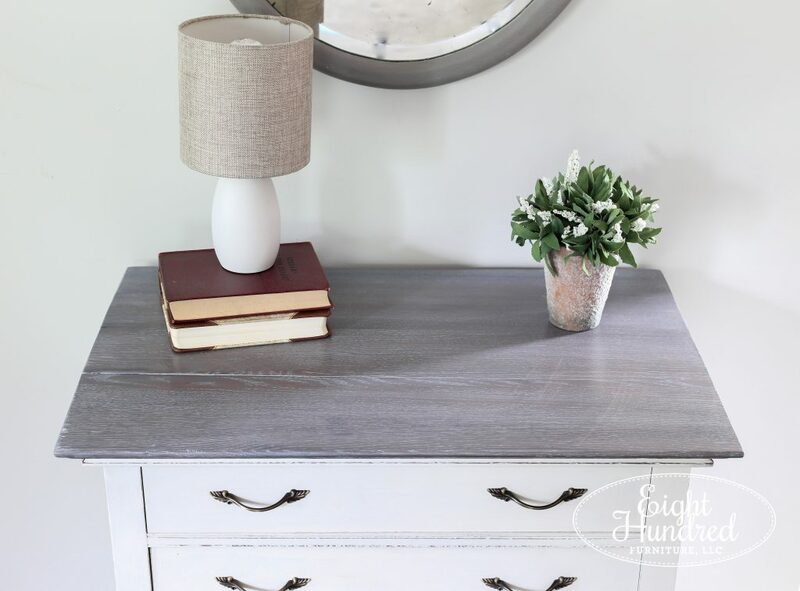 When the dresser was finished, it was really pretty but a little boring. 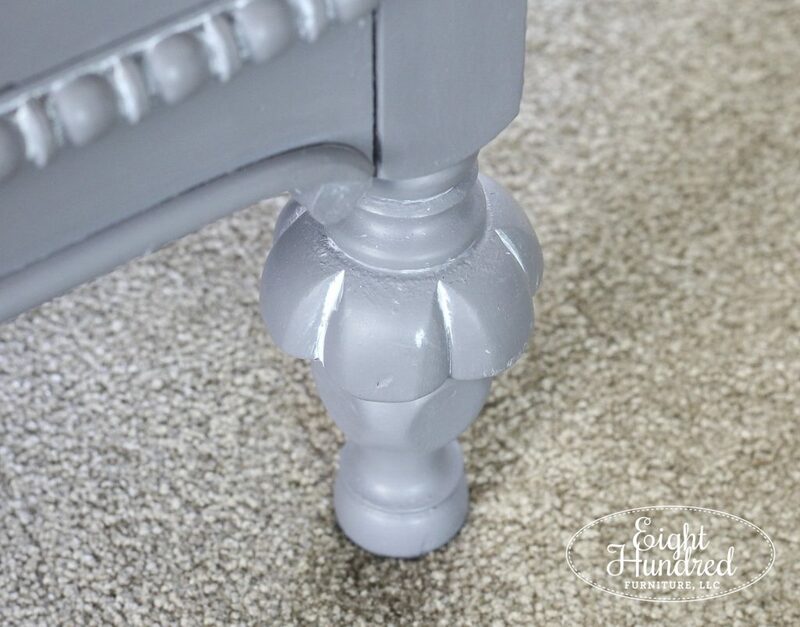 To draw your eye to the detail trim on the piece and the pretty feet, I used a bit of Miss Mustard Seed’s White Wax to highlight them. 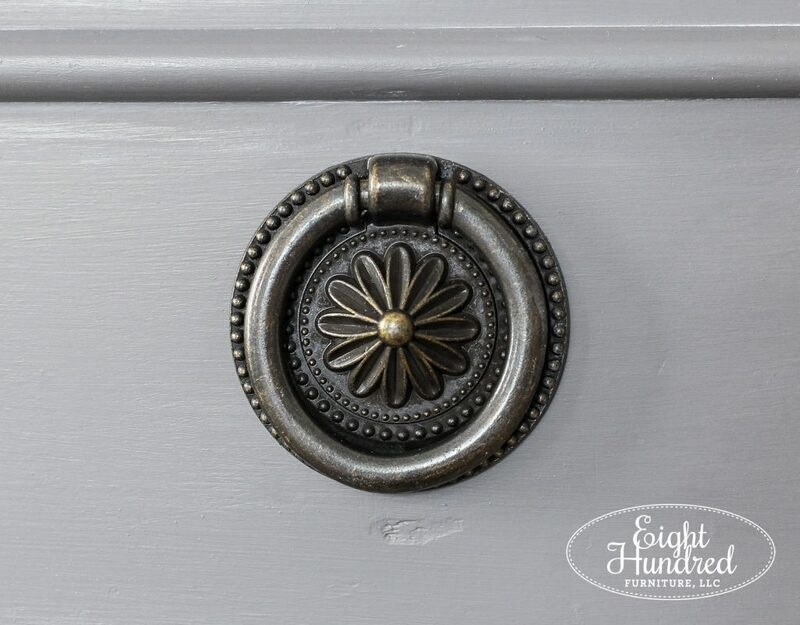 It’s subtle and draws your eyes right where they need to go to appreciate the details. I swapped out the pulls the dresser came with for a set of round gray metal pulls. They look much better, in my opinion. So here’s the dresser in all its glory! 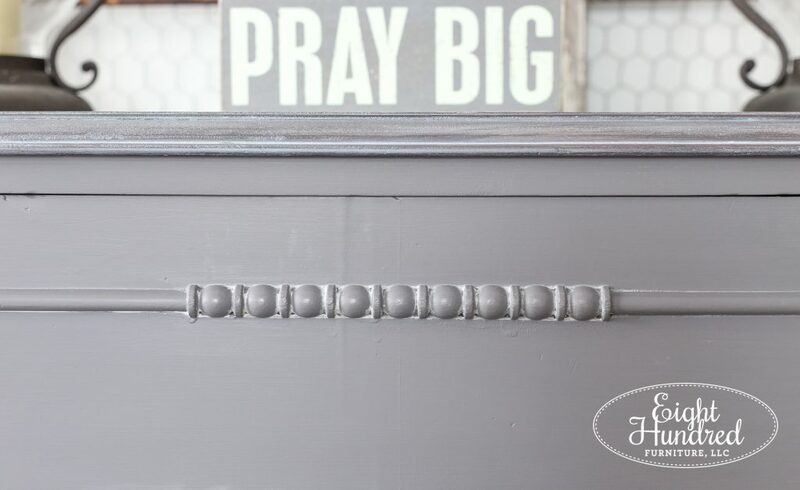 I didn’t seal the GF Milk Paint because it’s durable enough to sustain low to medium once cured. 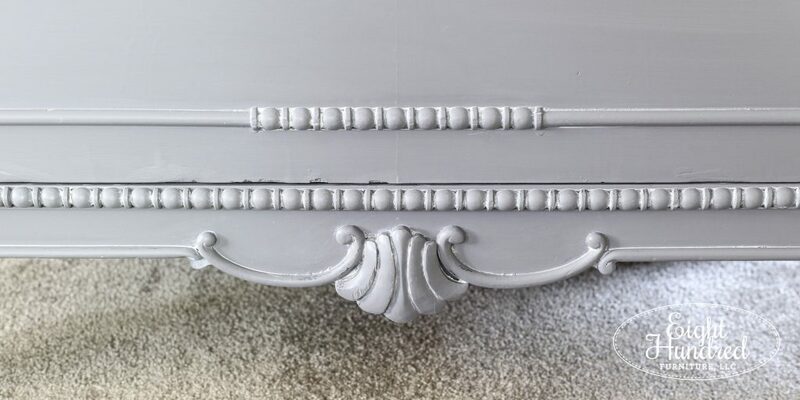 I figured the part of this dresser that’s going to get the most wear is the top, and that has 3 layers of High Performance Topcoat in Satin on it. As you can see, it’s not a perfect piece, but that’s okay with me. It’s an old dresser that’s been around the block a few times. It’s been loved, used (and probably abused) a lot in the past and I can’t cover up all of its scars. I find its imperfection beautiful and relatable. Things can still be pretty even if they’re imperfect. Here’s a look at some of the decorative trim on the bottom. 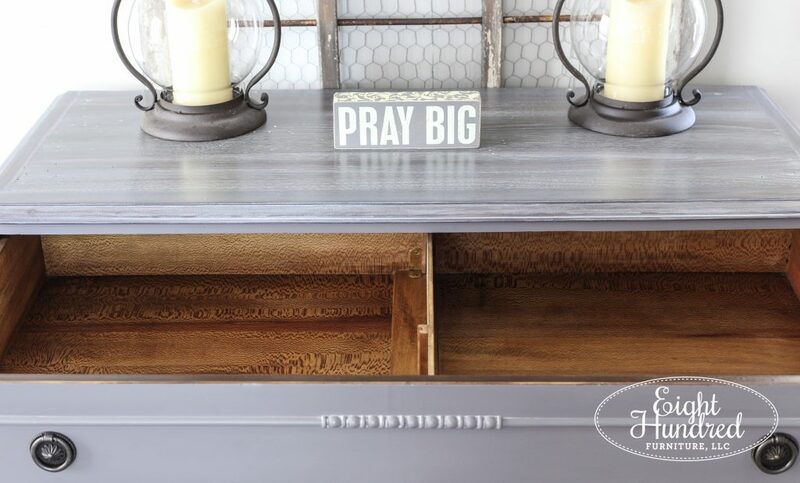 And the stained top plays so well with the painted bottom. It took a lot of vacuuming and scrubbing to get the drawers clean, but they smell lovely now and are ready for someone to put their belongings inside. I staged the dresser with a few metal carriage lanterns and propped a greenhouse window behind it. 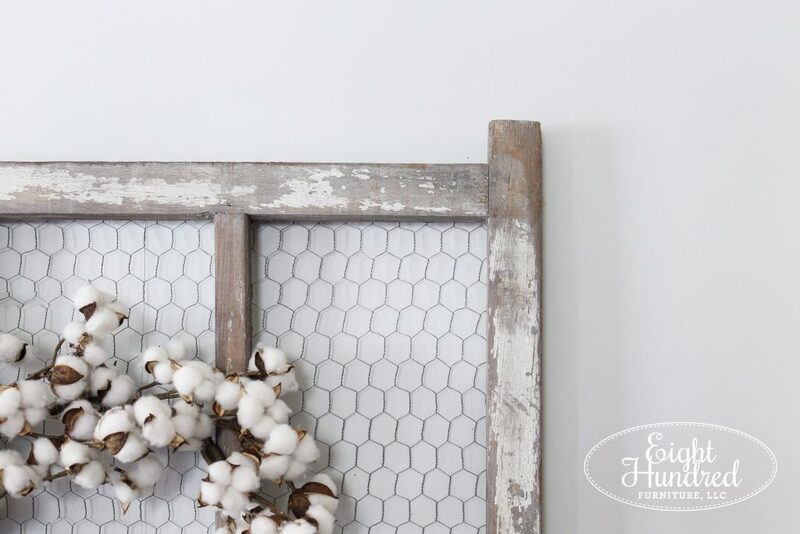 The finishing touch was a cotton wreath hung with some twine. Here’s what the window looks like by itself. 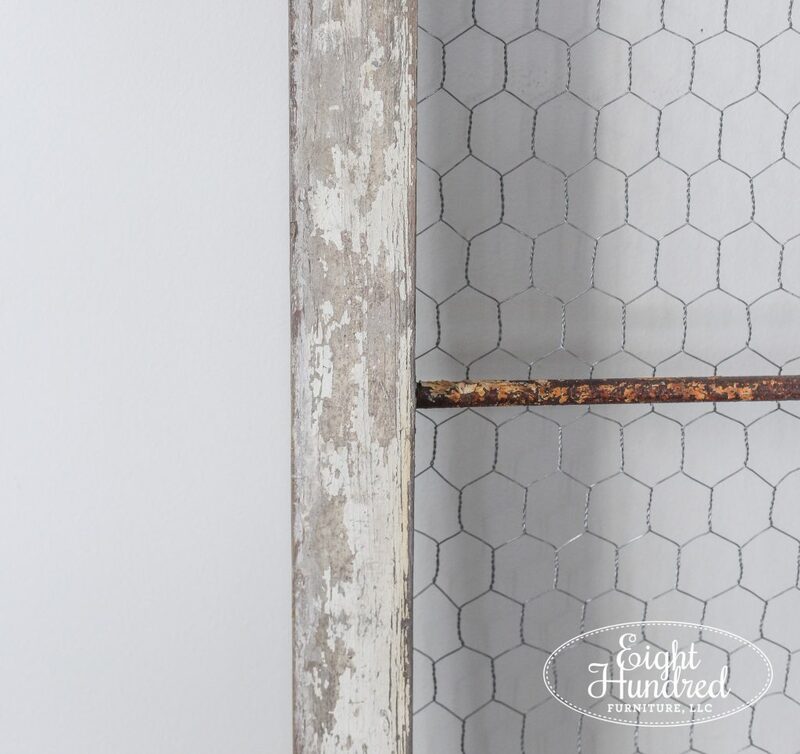 It has so many potential uses like backdrops for dressers, photo displays, wedding reception table card displays, light fixtures, headboards, etc. Let your mind run wild with the possibilities! 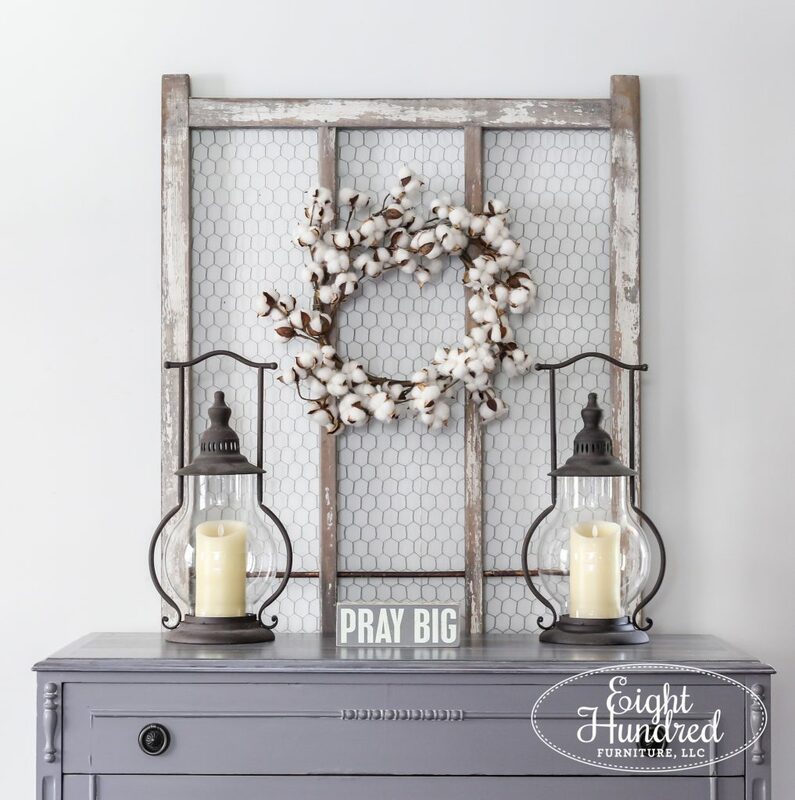 When I bought it, I sealed all the original paint with Miss Mustard Seed’s Tough Coat and stapled chicken wire onto the back. 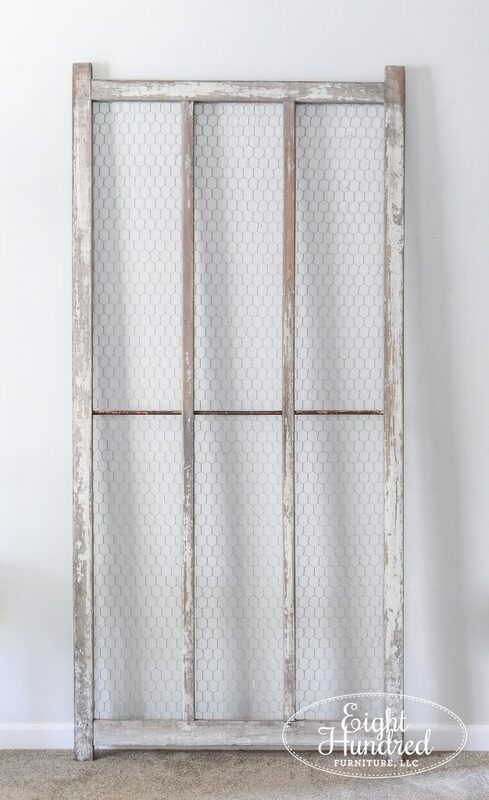 There’s a metal bar going across the middle which served as a support when it was used as a greenhouse window. Isn’t that original paint charming? 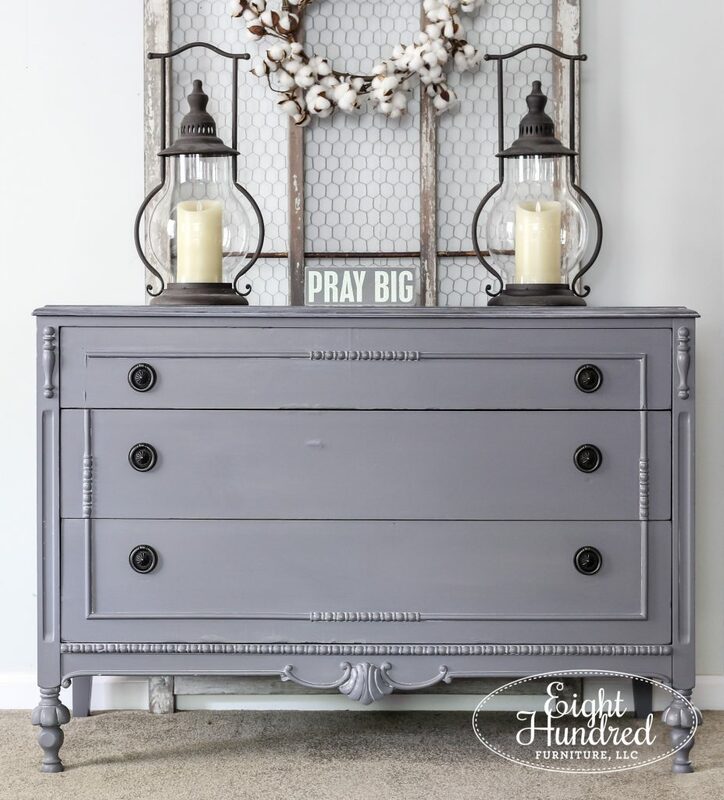 This dresser is available for $295 plus tax and measures 48″ long, 20″ deep and 34″ tall. 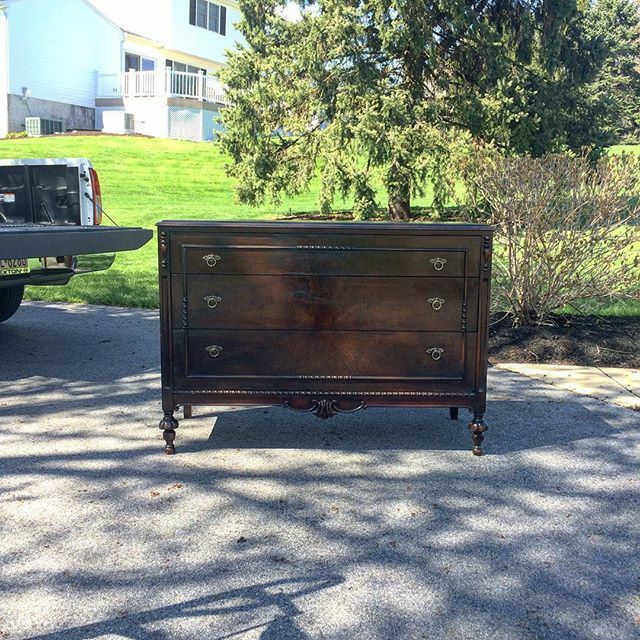 This pretty piece will make its way to Morgantown Market in a few days if it doesn’t get snatched up before then. The greenhouse window is for sale too as well as the carriage lanterns. If you’re interested, shoot me an email!